Maravillosa!!!! Es una delicia, un verdadero capricho!!!! ♥♥♥♥ La camita me ha encantado, pero la casita dentro de la casita enamora!!! 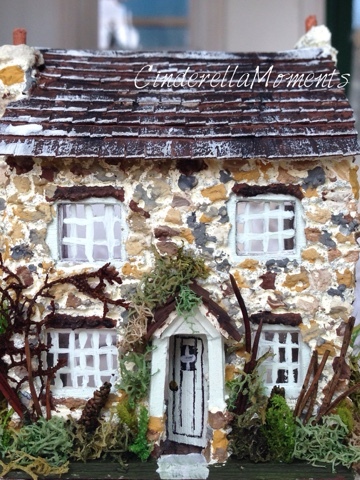 I have always loved that cottage in the movie! I love the bathroom and tub in the movie house. 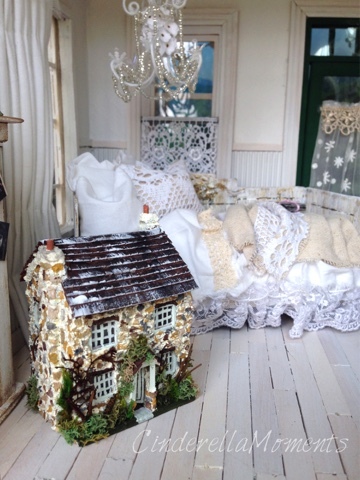 :) So quaint- the perfect Christmas/winter place to snuggle up in front of a fire! You did a great job! 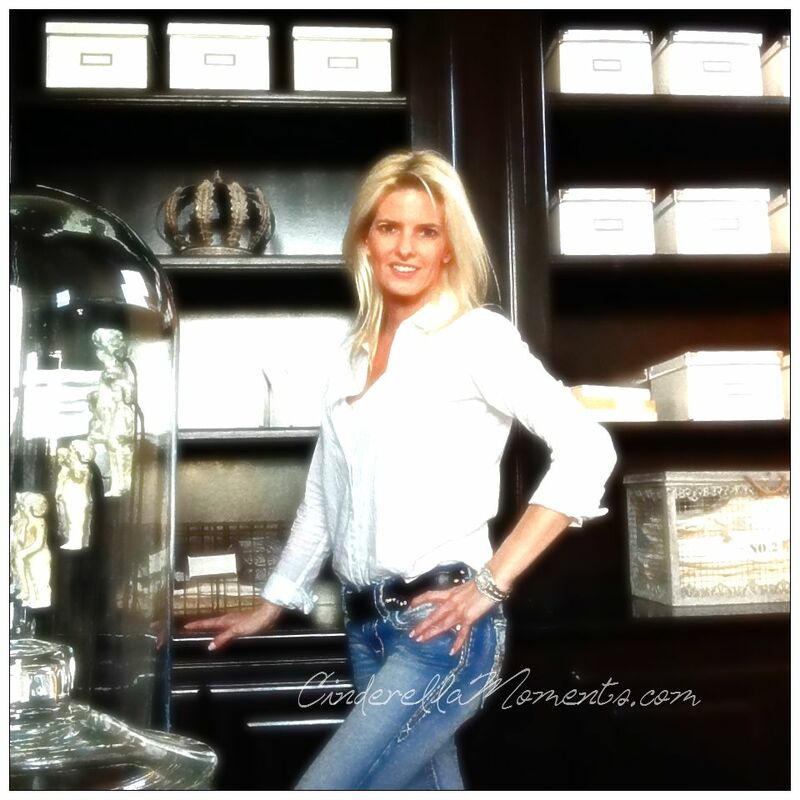 Love the teeny tiny furniture pieces! So Sweet! 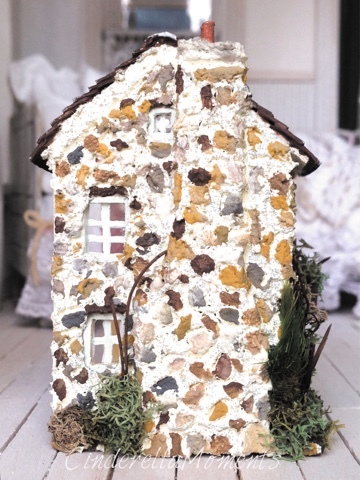 Love the tiny furnishings inside the house and also the stone finish on the exterior. Simply Adorable! Que preciosidad de mini casita,te ha quedado genial y con tu toque personal!!!!! It has become so irritating. 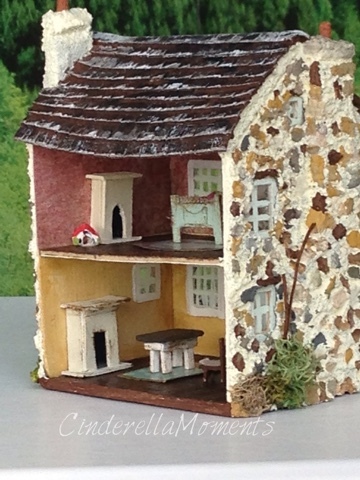 Enchanting and lovely dolls house in 1:144 scale, Caroline, it's fantastic work. 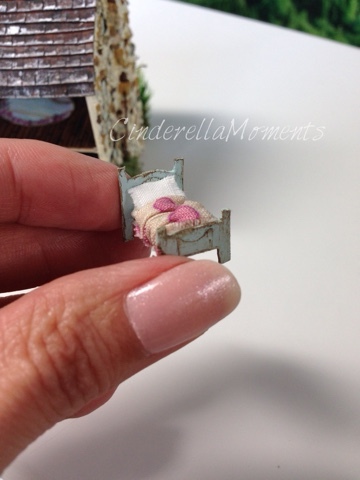 You even made the furniture, so teeny tiny!! The tiny cottage is very nice. This is SOOOOOOOO cute!!! That wee little bed is just the sweetest thing ever! You always outdo yourself Caroline...oh, and how the heck to you do all these fiddly things yet still have such beautiful hands and fingernails??? 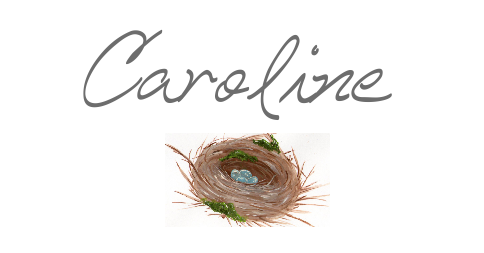 Oh Caroline, it's just divine! 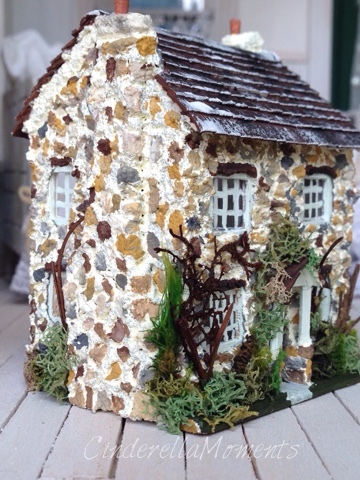 Hi Caroline...what a fantastic idea and how great did it turn out....l love the stone cottage look and that it functions like a "real" dollhouse with all the accessories and detail. Goodness that bed is tinsy...you have the patience of a Saint to put all that together:-) Hope your week's going wonderfully...hugs Bron. Oh, I LOVE this so much!!!! 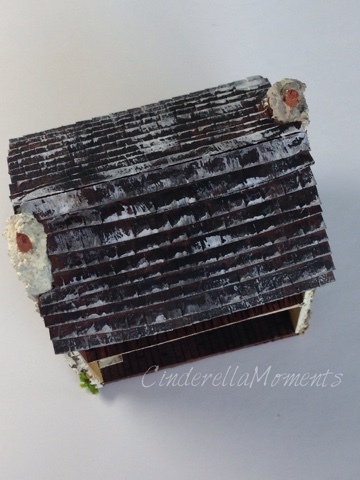 I have recently (a few months ago) made a tiny roombox in 144th scale. It is tricky to find the small fabrics, but I Love to make the really tiny things! 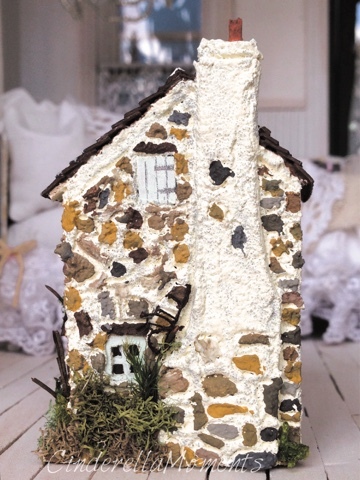 Your cottage has so much charm and the right atmosphere! Thank you for sharing! It is very inspiring! 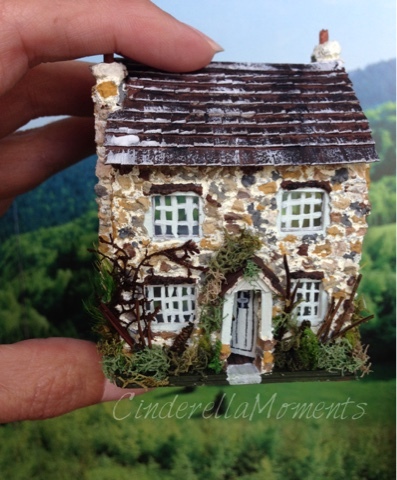 Your mini dollhouse is so cute and the details are perfect as always! 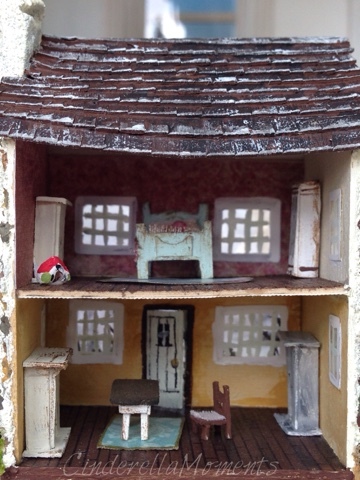 I especially love that it has its own even tinier dollhouse inside! !!!! Es una preciosidad Caroline, me gusta muchísimo el exterior de la casa, con ese aspecto rústico y tantísimos detalles. La cama es encantadora y la mini mini casita increible. It's beyond cute!! So much detail in something so tiny. Absolutely love the bed. You are very brave to take on 1/144th scale. 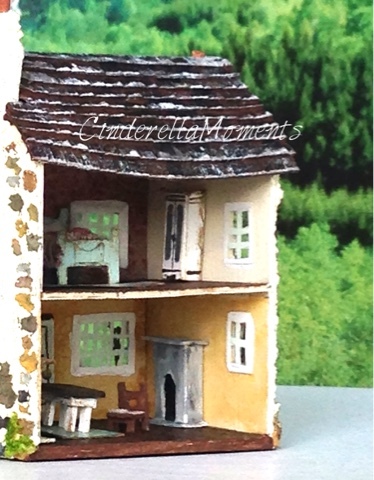 The little house is so cute. I don' t think my eyes can focus on such detail, nor my slightly arthritic fingers hold such tiny things, nor my sometimes feeble brain concentrate . I'll enjoy your success. Wow Caroline I love your tiny house and all the furniture is amazing. The tiny bed is stunning. I love your work as always. What an adorable little house! I love, love it! 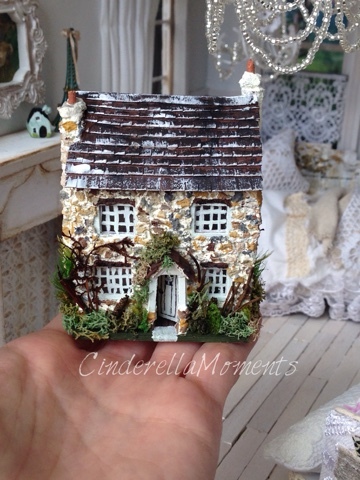 I love the beautiful little house! Amazing work! and thanks for visiting.....always love to hear from you. Your tiny house is amazing. 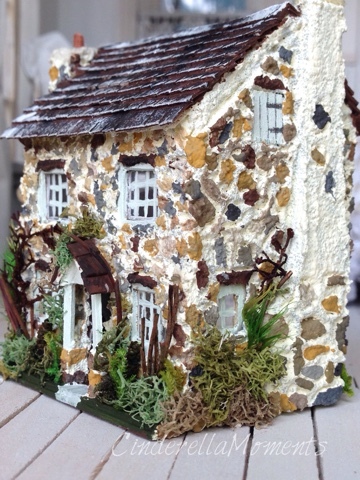 to have managed to make stone walls in such a small scale is fantastic. And a tinier version of your great beds is stunning. I love everything. OMG, ur weensy house is so adorable! I giggled in delight while previewing your blog. ; D still loving all ur creations. I'm at my other website wizardlyfun.com until Halloween. Thought I'd have a bit if potter fun with the new movie coming out in November (fantastic beasts).